Place the prawns in a large bowl, add the soy sauce, toss to coat then cover and refrigerate for 10 minutes. Drain prawns from marinade and thread onto skewers. Spray with a little cooking oil spray. Place the sesame seeds on a large plate. Liberally coat each skewers in the sesame seeds. Heat a little oil in a large non stick frying pan over medium low heat. Cook the skewers in batches, turning once gently until golden and cooked through. While the prawn skewers are cooking, combine the chopped mango with the peanuts, herbs, rice wine vinegar and two tablespoons water. 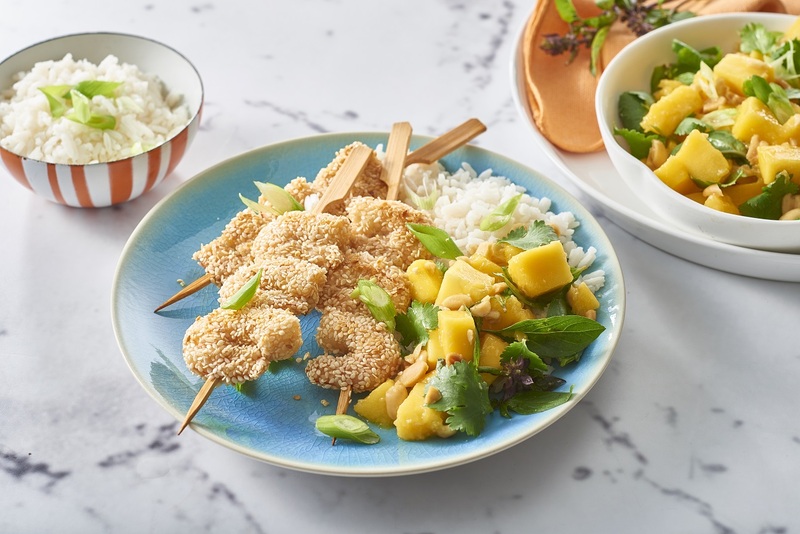 Serve the skewers sprinkled with extra sesame seeds, along with asian mango salad and rice or noodles. Garnish with green onion.